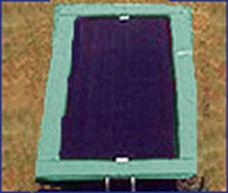 Rectangular trampolines are a great way for kids and adults alike to burn energy. At the same time, if you're hoping to gain energy, the movement helps give it to you, as you leap into the air with your rebounding device. A rectangle trampoline, like this 8ftX14ft rectangular trampoline can give your child the confidence and motor skills they need later on in life. People of all ages can use a trampoline for recreational purposes or even to practice or stay in shape for sports. The possibilities are endless! (Springs attach to holes in the frame).